This morning when I woke up I wanted to write a blog about the failure of the Super Committee in the other Washington. The title was going to be something like, “RESPONSIBILITY IS LIKE KRYPTONITE TO CONGRESS!” or “UN-SUPER-SIZE ME.” It would have been a fun and, shall I say, easy blog to write. I wonder if living right now is what it sort of felt like as Rome fell? But I got sidetracked. I spent most of the morning putting away decorations from the absolutely amazing Agapefeast Sunday night and moving around church platforms, setting up candles for advent, and trying to get things put back together. Then we discovered that we were short of pens for the Sunday bulletins this weekend, but we knew where they were. They were in the pouches on the back of the seats in the sanctuary. Most everyone is away for holiday, so I ended up digging through these pouches of disgust. I mean it, it was disgusting. So, now I’ve decided to use my blog today to enumerate SOME of the things I discovered in those nasty pouches. 1. Pens–I actually did find pens. I did not find as many as I thought I would, but there were enough to keep us from having to go quickly buy more. 2. Old Propaganda–There were bulletins, inserts, promotional materials, and our daily devotional guides that date all the way back to summer. Good to know people are using all that stuff we work so hard on. 3. A Book–A preschooler’s reading book was stuffed inside. I wonder what poor child has been looking for that book at home? And for how long? 4. Offering Envelopes–I found a lot of, I mean a lot, of offering envelopes. And yes, I checked for money and they were all empty. 5. Communion Cups–Yuck. That’s just nasty. 6. Snot rags–I’d like to think those are necessary because of my emotional tour-de-force sermons. Probably not. 7. Crayons–I hope these were left by children and not deacons, teaching elders or the staff. I should probably be thankful (it is that season, isn’t it) for the things I didn’t find. I didn’t find heroin needles, half eaten doughnuts, missing children, or mean notes about me–which I have found in the past when I’ve done this sort of thing. Actually, there was one more thing that I found. 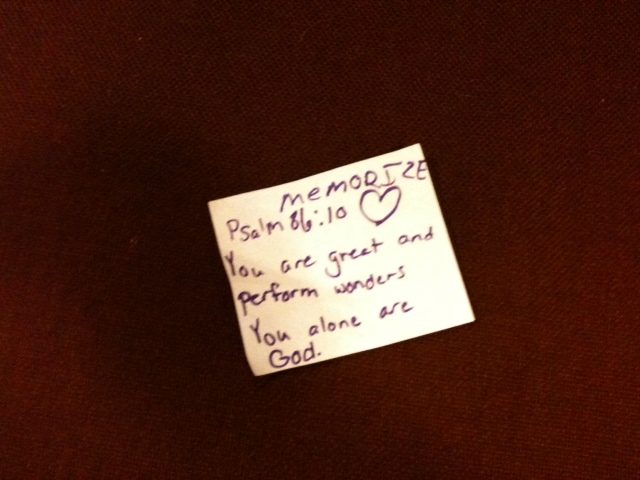 It was a piece of white paper with the words “MEMORIZE,” a drawn heart and Psalm 86:10 written out completely, all in purple marker. It was clearly written by a child. I think finding that alone was worth all the yuck. it was ewwwwweeeeee big time. i didn’t mention the candy and candy wrappers i found. those were really ewwwweeeeewwwwwweeewww.